tl;dr: Big unicorns continue to hire at a relatively constant pace, while workforce size at smaller unicorns may be hitting a plateau. Startups come in all shapes and sizes. There are tiny two-person operations in garages and dorm rooms, and big companies like Airbnb and Uber that, at this point, are hard to call startups with a straight face. Lately, most the attention has been directed at unicorns. Although the definition varies slightly, a unicorn is a technology company, usually privately held, that is valued at $1 billion or more. The number of unicorns has grown significantly over the past few years. And so have the companies themselves. 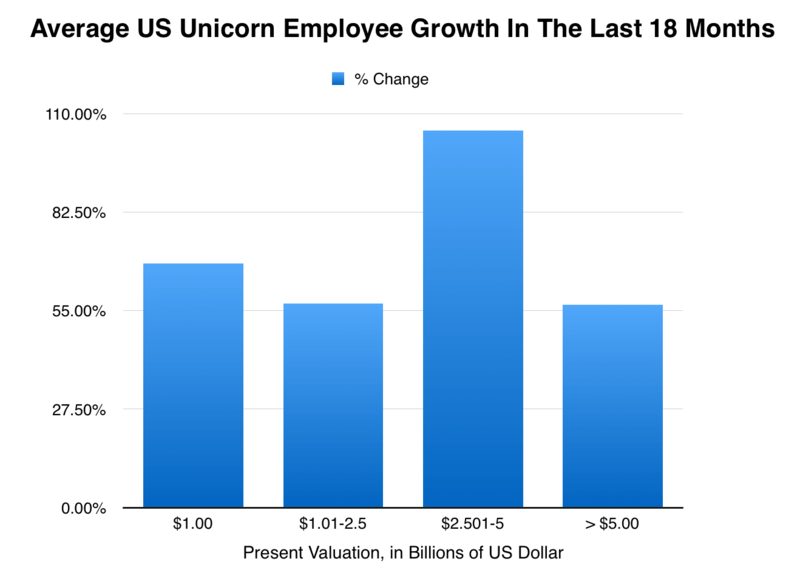 Unicorns have grown in value, hopefully in revenue, and certainly in headcount. After all, when you consider it, most new capital—the oxygen of the unprofitable—goes towards people. And unicorns, which have in some cases raised billions alone, like to hire the best. We decided to investigate the trends underlying unicorn hiring, hoping that the ensuing data and resulting charts would help us better understand how the wealthiest private companies approach talent acquisition. To frame the question, we broke unicorns into domestic and international cohorts. Took the US-based set, and sorted them into four broad valuation buckets, a decent proxy for scale, and maturity. Here’s what we learned. Valuation may have a role to play in talent acquisition. The following chart depicts the growth of unicorn workforces over the past 18 months. Each sloping line represents the aggregated workforce growth of 76 US-based billion-dollar-plus companies in CB Insights’s list of unicorns, segmented by their current valuation, during that period. Digging in, headcount growth at smaller unicorns valued at $2.5 billion or less has started to level off over the past twelve to eighteen months, whereas the number of employees at larger companies is growing at a constant (or even accelerating) pace. Furthermore, companies that are valued between $2.501 billion and $5 billion have grown the fastest and most consistently over the past eighteen months. In fact, headcounts at the average unicorn of this size have more than doubled (up 105%) since May of 2015. Why might this be the case, and why does it matter? To answer the latter question first, it’s not just that companies valued at $2.501 billion or more are growing their workforces more on a percentage basis; in absolute terms, they’re hiring more people than smaller unicorn peers. Based on an analysis of the complete list of 96 US-based unicorns (which excludes Uber, for reasons we discuss below in Methodology Notes), the average unicorn valued at over $5 billion has over three and a half times more employees as those valued between $2.501 billion and $5 billion, which are, in turn, 50% bigger than the next rung down. So even a small bump in hiring for these mega unicorns, from a percentage perspective, can mean adding a hundred or more people to the organization. 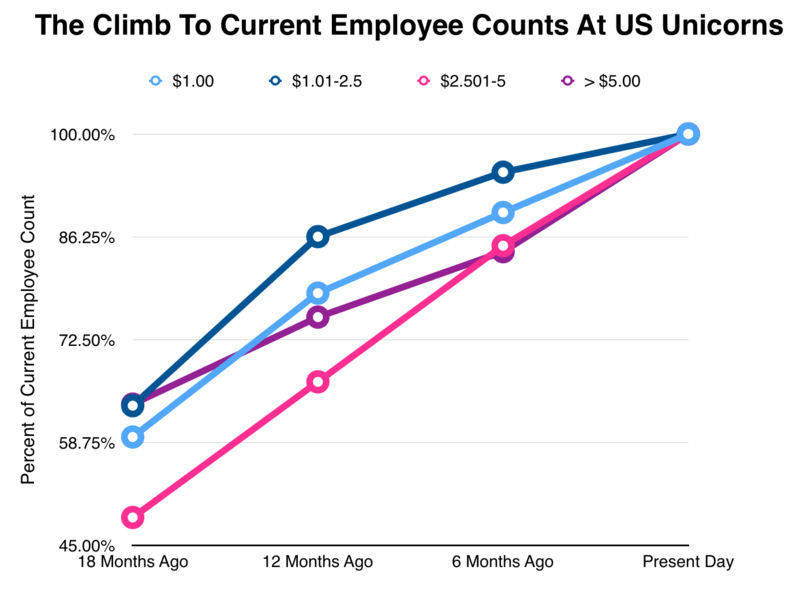 Why have these more valuable unicorns grown their employee bases, and why has the $2.501-$5.00 billion valuation segment performed so disproportionately well? We have a couple of theories. As these companies have gained a more commanding position in their respective industries, most grow their workforces to expand their market share, not just from other startup companies, but from the old-school incumbents most of these unicorns are dead-set on “disrupting.” For now, there is plenty of private capital seeking a position in bigger unicorns, because they are growing and are perceived to be less risky than companies with lower valuations. Even the high cost of engineering talent and above-average base salaries demanded in expensive markets like San Francisco and New York City seem totally affordable in late-stage companies with investors at the gate. Conversely, this may explain why there is an apparent deceleration in hiring at companies valued between $1 billion and $2.5 billion. As Mattermark reported, late stage funding activity has been hit hard. In Q3 of this year, dollars invested in Series D, E, and later rounds declined by around 65% relative to the same period last year. This “flight to quality” may be leaving smaller unicorns behind, and, accordingly, these companies have had to slow their pace of hiring to slow the growth of their burn rates. It’s also possible that some of these larger unicorns are expanding their organizations in anticipation of initial public offerings. Facebook, for example, more than doubled the number of full-time employees at the company between 2010 and its IPO in 2012, according to data compiled by Statista. That might be what we’re seeing with some of these unicorns, but given the slow IPO market, and the aforementioned availability of private capital, the “IPO preparedness” factor might not be so significant here. But what about the set of companies in that seemingly “magical” $2.501-$5 billion valuation segment? Why are they growing their workforces so quickly? They might be in a kind of goldilocks zone, valuable enough to attract a lot of talent but not so big that the pace of workforce growth is beginning to slow down a bit. As the chart above showed, much of the employee growth of $5B+ companies has already been baked in. 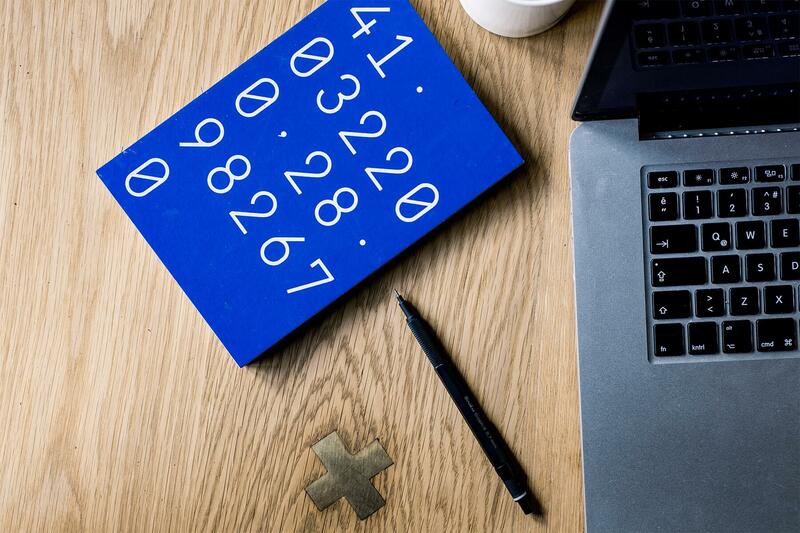 As we’ve seen, employment statistics offer an interesting and perhaps more accurate perspective on company growth than valuations or past fundraising history alone. Although aggregating companies by valuation cohort loses some of the fine-grain resolution, it points to general trends in how comparably-valued companies approach hiring. The leveling-off in hiring that many smaller unicorns are experiencing may portend bad news for these companies going forward as quality talent continues to go toward ever-expanding companies on the other side of the unicorn valuation spectrum. For now, it’s good to be big. Jason D. Rowley is a journalist and independent researcher based in Chicago. His weekly(ish) newsletter on tech, venture capital, and culture is worth reading. We took CB Insights’s list of unicorn companies and filtered out all of those that aren’t headquartered in the US, leaving us with a list of 97 companies. We then pulled historical employment data for each of these companies from Mattermark. We removed Uber from our analysis because many Uber drivers list the company on their public job history, even though they aren’t technically employed by Uber. (They are independent contractors.) There are currently over 28,000 people who claim to work at Uber on Linkedin, and it would have been prohibitively time consuming to disentangle the independent contractor data from the full-time employee data, especially for historical data. The table we displayed shows data for all 96 companies in our analysis (the original 97 minus Uber). However, the bar chart and line chart use data from only 76 companies, aggregated by valuation. This is because there weren’t historical employment statistics available for either the 12-month or 18-month time horizons for twenty of the companies. However, because we’re dealing in averages here, we stand by the validity of our findings.